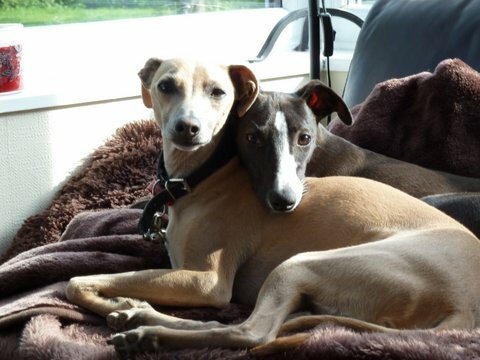 Dusty is an elderly Italian Greyhound who went missing 10 May 2013, when out for walk in the Dunwich Heath area, Suffolk. She became frightened,slipped her collar and bolted. Her owner spent a sleepless night worrying, and thanks to the efforts of Dog Lost volunteers, who were out loooking and postering the area early this morning Dusty was found safe and well today. Dusty’s owner would like to thank Dog Lost and its volunteers for all their support and help. If you don’t know about Dog Lost take a look at their website – you never know when you may need their help, and you may be able to help someone be reunited with their lost dog! www.doglost.co.uk. 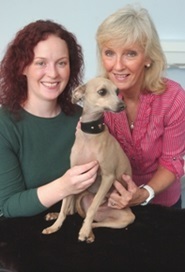 Italian Greyhound Rescue brings many challenges, but none more so than a young dog with a hind limb injury, compounded by severe behavioural issues. The Italian Greyhound Rescue Charity exists for the benefit of all Italian Greyhound and Italian Greyhound Cross breeds so we readily accepted the challenge to undertake to do our best for Albie. Albie came to live with me as his foster carer, so that I could work with him to assess, and hopefully address, the behavioural issues and also take care of him while we worked out a plan to get him the best medical care possible. 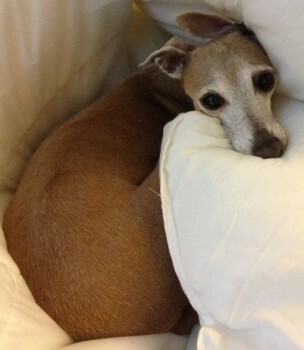 We have never dealt with such a disturbed Italian Greyhound, and one who was in very bad physical shape. Albie’s fractured femur had been pinned and wired, however, despite regular veterinary check-ups confirming that all was well with the surgery, Albie refused to use his leg and rarely put his foot to the floor, preferring instead to use three legs. After three months, while progress was slow Albie’s psychological well being was improving as I was able to work with him under the guidance of a Canine Behaviour Specialist. His leg however was not looking good and Albie still chose not to use his damaged leg which was withering with lack of use. Fortunately for Albie, I attended a breeders’ seminar at The Croft Veterinary Hospital, Cramlington, near Newcastle (www.croftvets.co.uk). One of the presenters was renowned Veterinary Surgeon – Malcolm Ness, who specialises in Orthopaedic Surgery, a golden opportunity to mention young Albie to him. Malcolm undertook to reassess the old injury and we forwarded all the information we had about the history of Alfie’s injury to him. His diagnosis was not good – Albie’s fracture had not healed and the cerclage wires were loose, causing the pin to protrude into Albie’s hip due to the collapse of the bone. It goes without saying that Albie must have had a lot of pain, yet he never showed any aggression towards me while I was his foster carer, although men were a completely different kettle of fish as far as he was concerned! Malcolm told us that we had two options: (i) that Albie be put to sleep to spare further suffering; or (ii) that Albie underwent more surgery to remove the wires and pin; perform a bone graft and secure the fracture with a new plate, which might remove Albie’s pain but probably leave him with a limp, and there was a significant risk that the surgery would not be successful and Albie would have to have his leg amputated. The first option of putting down and an otherwise healthy young Italian Greyhound (albeit with behavioural issues) was a non-option. While surgery was not without its risks and amputation was a possibility, Albie had shown us that three legs instead of four were quite manageable as far as he was concerned! So, the decision was taken to go ahead with the surgery in the hope that Albie would make a good recovery and be pain free for the rest of his life. Before Albie was admitted for his surgery we had a consultation with Malcolm, who seemed unconcerned about Albie’s behavioural issues, but who was very concerned about the swelling from the pin’s protrusion and the withering of his leg. All the veterinary staff were warned that Albie would not miss a chance to ‘have a go’ at a stranger. A lovely nurse called Jess was assigned to Albie he was settled into his pre-surgery kennel. A tour of the state of the art veterinary facilities at The Croft Veterinary Hospital featured at the seminar so I knew how lucky this little dog was and how well cared for he would be. Albie’s surgery was complicated, the bone ends were tidied up and a synthetic bone graft and compression plate and screws were inserted to his femur. He remained in hospital for four days, each day; morning and evening I received a call from Jess who let me know how he was getting on. On the day that Albie was discharged, I drove up to Cramlington wondering whether or not Albie bitten anyone during his stay! To my complete surprise I was told Albie had befriended one of the Vets, Carolyn, a young lady who was also a trained Canine Behaviourist. But true to form he did on one night leave his mark on a Veterinary nurse who had her head and shoulders inside his kennel to clean it out, whilst Albie was free to wander around outside. He walked up to the young lady’s bottom and gave it a nip! What a joy it was to see Albie walking on all fours when he was led into the consulting room. He hadn’t forgotten me and was very keen to show me that he was able to walk on four legs again! His rehabilitation was going to be a long process with short, on-lead walks four times a day, gradually building up his strength and walking him for longer periods of time . It was amazing that Albie did not once carry his hind leg or limp following his surgery and he stood four square, proving what a wonderful job Malcolm had done to repair the difficult fracture. Italian Greyhound’s bones are not the easiest to repair being fine and long, and even more challenging when there have been some months and a failed repair in between. Albie carried on returning to the Croft Veterinary Hospital for regular check-ups until the X-rays confirmed what we could see with our own eyes – that his leg repair was finally healed. Four months after Malcom had operated and no one would ever be able to tell that Albie’s leg had been fractured or the pain and trauma he had endured. The Italian Greyhound Rescue Charity will be ever grateful to Malcolm who gave all his time and expertise along with that of his staff at The Croft Veterinary Hospital to treat Albie free of charge. 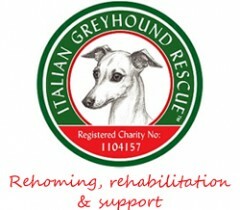 It has been an excellent experience for The Italian Greyhound Rescue Charity to work in partnership with The Croft Veterinary Hospital and the Charity would not hesitate to recommend this Orthopaedic Specialist Veterinary Practice to other IG owners/carers. Happily Albie was formally adopted by the Vet whom he befriended, Carolyn, and those who helped him overcome a difficult time in his life have now become his family. A happy ending for a gorgeous boy who had a very difficult start in life. Two rescues happily in their new home. Download and complete adoption questionnaire and submit to rescue team for vetting. If application is successful your name is added to our register of prospective owners. When an Italian Greyhound comes into the charity that seems suitable for you, you will be contacted. A home check will be done to ensure your home is safe and suggestions may be made to remedy any concerns. For fuller details of the process go to the ‘So you Want to Own An Italian Greyhound’ page when you will be able to download the questionnaire.